1. Kartals (blocks). 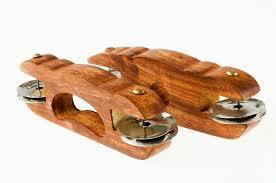 It consists of a pair of wooden blocks with jingles or crotales (kartals mean crotales). One pair is used in one hand of the musician. These pieces can be clapped together at high speeds to make fast complex beats. 2. Kartals (small sheets). It consists of a pair of thin, hard wooden pieces similar to the percussion bones (instrument). These are used in Rajasthan. 3. Kartals (cymbals). The karatalas are small cymbals, also known as manjeera. These are used in devotional chants. In Maharashtra Kartals are better known as Chipdya. It is commonly used in religious song like Kirtans an Bhajans. In Telugu language, the word Karatāḷa Dhvani is most commonly used for sound produced from clapping hands. Khartal “Rajasthani Bones” was founded in 2014 and is the only authentic manufacturer, distributor and teacher of this incredible Indian percussion instrument in the USA. Indian instruments like tabla and sitar are not readily available in music stores across the USA due to high shipping costs, limited accessibility to teachers and difficulty repairing broken instruments. Khartal is low maintenance, inexpensive, super durable and its made locally in Brooklyn, NY. We will upload free online tutorials on how to get started our website and provide the ability to schedule a Skype lesson or a 1-on-1 private lesson.